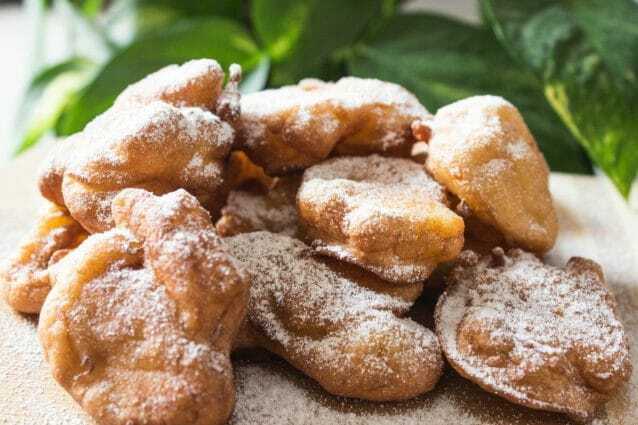 This recipe of apple fritters is super simple and irresistibly delicious. Just pile up a few basic kitchen essentials in a bowl, toss in luscious and juicy apple chunks, spice it up with apple’s best pal cinnamon and there you have it… an incredible heap of fruity goodness. I love to enjoy my favorite apple fritters with a huge dollop of creamy and smooth vanilla ice cream, a generous serving of dark chocolate sauce and a few toasted almond flakes. Mannn… I can’t even describe the joy of eating such an incredible ‘Happy Meal’! In a large bowl add all purpose flour, ½ tablespoon powdered sugar, salt, baking powder, and mix it a spoon until well combined. In another bowl whisk milk and egg until well blended. Mix the flour mixture with the milk mixture until the two are just combined. In another bowl toss apple cubes well with cinnamon powder and 1 tablespoon powdered white sugar. Now, add the tossed apple pieces in to the flour mixture and give it a nice whisk. Heat oil in a small pan and add large dollop of the fritter batter along with apple chunks carefully. 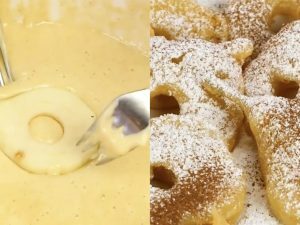 Repeat the process and add more ladleful of batter at a distance of about two inches from one another. Fry the fritter until golden brown in color. Flip the fritters and fry the other side to golden brown. Flip the fritters again to fry them until brown in color on all sides. Transfer the fried apple fritters to another bowl. Repeat the process with the remaining batter. 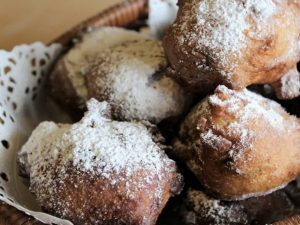 Dust the piping hot fritters with icing sugar and enjoy! Crack open the egg very carefully in to the milk so that no piece of shell is added to the bowl. If you are not too sure of breaking it open perfectly then you may consider breaking the egg open in to another bowl first and then transferring it in to the milk. You may even prepare this recipe until step 4 up to a day in advance and then resume from step 5 before you plan to serve. 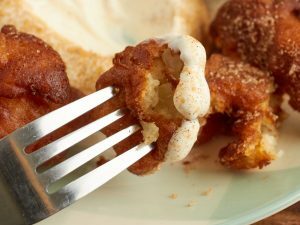 Easy apple, pear and banana fritters served with cream and cinnamon! Apple Pancake Fritters: a tasty treat!